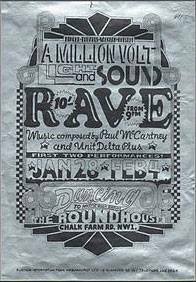 A tape of Unit Delta Plus music was performed at the Beatles-powered Million Volt Light and Sound Rave, 28 Jan and 4th Feb 1967 at London's Roundhouse in Chalk Farm Road. There is no evidence that it included any of Delia's music. BEATLE Paul McCartney has prepared a tape of electronic noises--known as music in some circles--for use at a “carnival of light” at Centre 42's Round House next month. Carnival of light? This is a new art form combining sound with light coming mostly from 15 automatic projectors playing onto 60ft-high screens, which changes colour according to the sound. There will be another five projectors developed from a Russian invention, whch create patterns, blending and blurring vividly coloured shapes. They will be hand-operated by artists and designers David Vaughan, Douglas Binder and Dudley Edwards, the three men behind this form of entertainment. 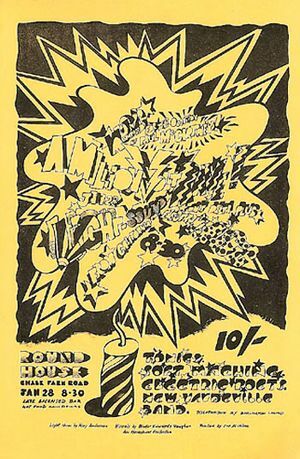 McCartney’s Carnival of Light was played at the Million Volt Light and Sound Rave after Brian Hodgson and Delia Derbyshire’s own out-of-office group Unit Delta Plus. ↑ DD082214: Newspaper clipping of article Trendy Beatle.